My first rule of grilling is that active fire must never be wasted. Does anyone else get an antsy feeling when you grill a meal, and the coals have yet to die out, and you can't stop thinking fire being wasted...must find more things to grill, and suddenly your guests are stuck eating alone because you've run into the kitchen, ransacked the fridge, wrapped half a dozen vegetables in foil to place directly on the embers, and are standing around wondering how frozen dumplings will do over charcoal? That's why my second rule of grilling is to always be prepared. Despite the fact that there are hundreds of so-called grilling "essentials" on prominent display at food stores and in catalogs, you figure out over the years that the only real tools you need are the ones that help you bring your food close to fire, preferably without burning yourself. After all, isn't that what grilling is really all about—food and fire, in all their primal glory? Well, close, but not exactly. Here are the items that you really need. Everything else is just bells and whistles. And please, don't even think about buying those "grill kits." Not even as a gift. For the high heat essential for searing and flavor, nothing beats cooking over the smoldering embers of real hardwood charcoal. But once you're in the coal-cooking category, there really isn't all that much difference from grill to grill. Choosing the right one basically boils down to three factors: size, ventilation, and ease of operation. I recommend a large grilling surface. It allows you to cook for large groups and offers enough space for the all-important two-zone fire. With plenty of space to bank coals on one side, you can create an ultra-hot searing zone while leaving the other side of the grill relatively cool in order to gently finish cooking chicken breasts, burgers, or steaks to your desired level of doneness. A large surface area and domed lid are also essential if you plan on doing any grill-roasting of whole birds or larger cuts of meat. Ventilation is key, particularly around the coal area. Look for a grill with a separate rack for keeping the coals elevated. This design allows ashes to fall through, which increases oxygen supply to the coals so that they can burn faster and more efficiently. As far as vents in the cover and base go, the positioning makes little difference—just make sure your grill has them in the first place. Finally, look for a grill with only the features you can afford. Heat-resistant handles, wheels, side tables, and easy-to-clean ash catchers are all nice, but they won't make or break your food. You're better off spending more money on a grill with a larger cooking area than a smaller one packed with features. For some recommendations, check out our favorite charcoal grills under $500. The Weber is the classic, and my personal grill of choice. What about gas, you might ask? If you don't mind sacrificing flavor for convenience (even our resident grilling expert, Joshua Bousel, is on the fence on this issue), then a gas grill can be a great, albeit far more expensive, option. If you're interested, read up on our picks for the best gas grills for under $1,000. All the same rules for charcoal grills apply to gas grills, but in this case, different brands perform markedly differently. Some don't burn hot enough; others heat unevenly; still others have badly designed grease-drainage systems, leading to flare-ups. The grill experts at Weber have the best models on the market, like the Genesis Premium EP-330. I haven't personally tested Weber's less expensive "Q" series ($359 at the time of writing), but it seems to get a strong thumbs-up from Joshua. Lighter fluid is fun to play with, but it can leave your coals smelling like gasoline, imparting off flavors to your food. A chimney starter is faster, cleaner, more efficient, and better for the environment. It's essentially a tall metal cylinder with holes punched in it and a grate at the bottom for holding the charcoal. It works with the power of convection: When a lit newspaper is placed at the bottom, igniting the bottommost coals, the hot air rises up, pulling fresh oxygen in through the vent holes and through the bottom. This constant supply of fresh oxygen, coupled with the fact that the metal efficiently reflects heat back toward the coals, means that you require nothing more than a single piece of newspaper and a match to turn six quarts of coals into a roaring inferno within 20 minutes. In the long run, it's also a much cheaper option than buying multiple bottles of lighter fluid. When buying a chimney starter, the only thing you really need to worry about is its capacity. A full six quarts of charcoal is just about enough to cover the entire cooking surface on my Weber grill, and, not coincidentally, that's exactly how much the Weber Rapidfire Chimney Starter holds. Neat! When I'm cooking indoors, I personally prefer the control that a shorter, seven- or nine-inch set of tongs gives me. But when I'm flipping a dozen steaks over a blazing-hot fire, I keep my distance. When shopping for tongs, look for ones made from two separate arms connected with a spring-loaded hinge. I also recommend seeking out tongs with scalloped oval heads, rather than those with forked or looped heads, which don't grip as well. While a locking mechanism is nice for storage, it's by no means essential. Be sure to avoid tongs made with lightweight, easily bent, and quick-heating aluminum—if the tongs don't feel hefty and well constructed the moment you pick them up, chances are they're not. I also steer clear of heatproof nylon-tipped tongs. Not only do they give you less grip and less control, they also aren't really that heatproof (trust me, I've melted them in the past). The OXO 12-Inch Stainless Steel Locking Tongs are what I use at home. Their solid construction has lasted for a good six years of heavy (and I mean heavy) use so far. They also happen to be the winner of our test of the best kitchen tongs for indoor use. A clean cooking grate is essential for good grill marks, even cooking, and ensuring that delicate foods, like fish and vegetables, don't stick. While a crumpled-up ball of aluminum foil held with a pair of stiff tongs will work to scour a grill clean in a pinch, a dedicated grill brush is a tool you'll want to use every time you fire up the coals. Most models come with stiff brass bristles. The problem with these: The bristles gunk up, bend out of shape, break off, and generally become completely ineffective after a mere half season's worth of use. 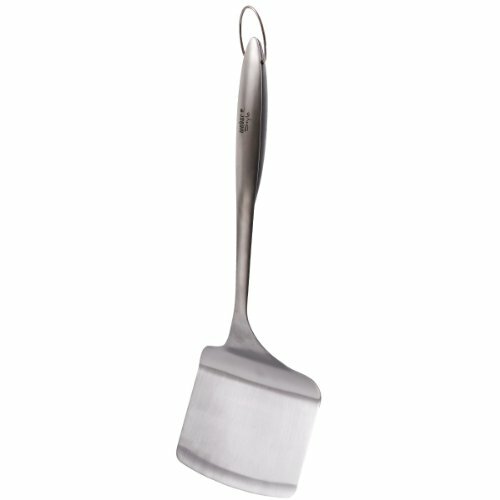 Weber comes to the rescue again with this grill brush. This sleek, brushed stainless steel number comes with two detachable and replaceable heads: a metal-bristle head and a scouring pad that conforms to the shape of any grill grate, removing bits of sticky barbecue sauce and melted cheese from spots you didn't even know your grill had. A word to the wise: It'll be faster and easier to clean your grill if you wait until it's nice and hot. 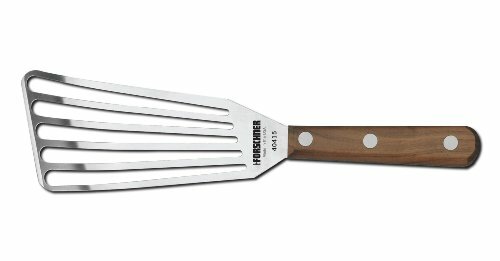 On the grill or in the kitchen, a flexible slotted metal spatula is one of the tools I use the most. Its strong head allows you to flip a big one-pound steak or a delicate piece of salmon with equal ease. The thin, flexible design will give you enough precision and control to ensure that you'll never lose another piece of chicken skin to the grill gods. Whatever brand you choose, look for a model with a slanted head, great flexibility, and a full tang (i.e., the metal head should continue all the way through the handle in one single piece). Here's our full review of the best fish spatulas on the market (but ignore the nomenclature—this spatula is for more than just fish). The only problem with fish spatulas? Short handles can mean singed arm hairs. That's where a heavy-duty grill spatula comes in. When I'm working over hotter fires, I prefer long-handled models with wide, firm heads, like the Weber Fish Spatula. Its wide size is great for cooking whole fish, or even for flipping grilled pizzas—a tough act for a regular spatula or wooden pizza peel. For ultra-delicate foods, like a flaky cod fillet, I use both spatulas, flipping the food with the slotted turner and catching it with the large surface of the grill spatula before gently lowering it to the grill. I've already extolled the virtues of the ThermoWorks Thermapen in The Food Lab's Top 10 Pieces of Kitchen Gear, so there's not much new to add here. And it's not just for grilling—here are all the reasons why we think you should own an instant-read thermometer. While it's on the pricey side, this Wüsthof carving knife was a favorite in our tests, and if you're spending all this time and effort trying to turn out perfectly cooked meat, you might as well slice it with a great tool. Its composite handle and full tang offer balance and support, while the lightly angled, slim bolster makes gripping the blade easy. It'll slice through all of your grilled meats like butter. Speaking of slicing, you'll also want a large carving board, with a grooved surface to catch any juices. We like this teak cutting board because it's large enough for major projects, but lighter than thicker boards, making it easy to transport from the grill to the dining room to the kitchen sink. Want to know how to keep it nice and clean and shiny? Here's our guide to seasoning and maintaining your wooden cutting board. And that's it. With just this short list of gear, you can be off and grilling like the pros. Editor's Note: This article was updated in May 2018 to reflect our current product recommendations, based on extensive equipment testing.